This is a sponsored post written by me on behalf of Neutrogena. All opinions are 100% mine. I worked at a medspa here in beautiful Orange County, California for 5 years. Yes, it’s home to the “Real Housewives of Orange County” and home to many women who pay big dollars to maintain their youth and skin. I learned so much from my time there. Let me share with you the best tip I learned. Wear a broad-spectrum sunscreen and use products that contain retinol. The doctors, physician assistants, nurse practitioners, and aestheticians that I worked with will all attest to this. The best regimen does not need to be complicated or expensive. When I was young, I was not informed about the dangers of sun exposure and prevention. But today, there is no excuse. It’s just a matter of finding products that work and being consistent in their use. 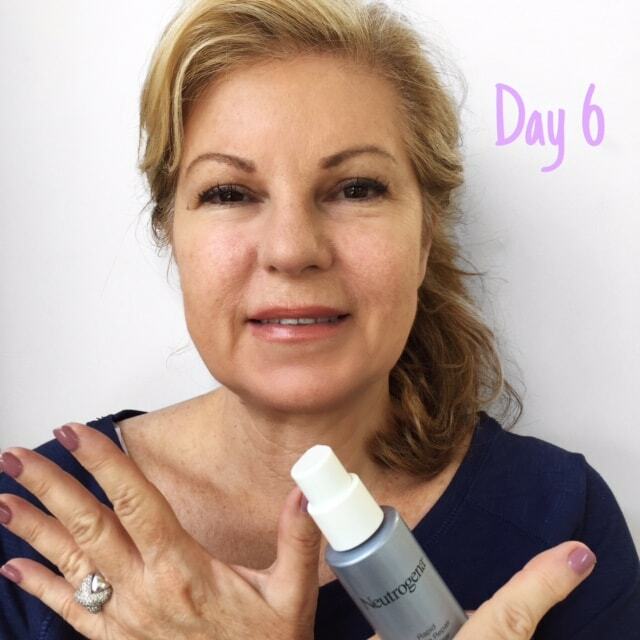 When Neutrogena approached me about trying their Neutrogena Rapid Wrinkle Repair Night Moisturizer for 7 days, I was happy to share my results. I already knew that retinol is the #1 dermatologist recommended anti-aging ingredient and that retinol helps to prevent new damage. It’s clinically proven to visibly improve the look of wrinkles, fine lines, tone, and texture. New research shows that regular use of retinol provides cumulative improvements in the appearance of wrinkles and fine lines, as well as skin clarity, tone, and texture even after one year of continuous use. So this means the retinol will continue to work to improve your skin. I also learned that the skin inside your wrinkle is often compromised by photo-damage. If not treated, wrinkles may continue to deepen, and may cause our skin to lose volume and fullness. I saw this first-hand during my time at the medspa. We now know that exposure to UVA rays can lead to premature fine lines, deep wrinkles, and uneven skin tone. I have also been using and loving the Neutrogena Ultra Sheer Liquid Daily Sunscreen Broad Spectrum SPF 70. It’s an advanced, dermatologist-tested formula with Helioplex Technology. The texture is so light that it easily spreads over my skin and absorbs quickly. There is no heavy or greasy feeling at all. It works well alone or under makeup and moisturizers. When I get dressed for the day, I put the sunscreen on right away. That way I know I am protected. Retinol works by prompting surface skin cells to turn over rapidly, making way for new cell growth underneath. It is common to experience a little redness and sloughing of skin when you first start using retinol. 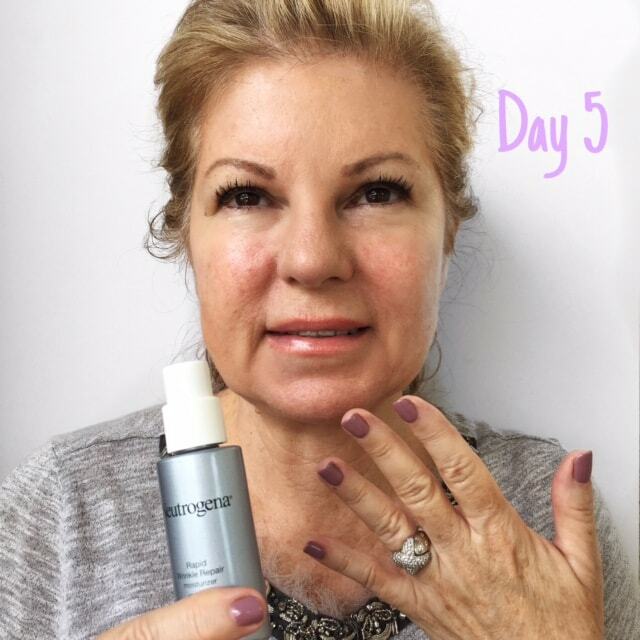 Here is my 7-day photo diary after using the Neutrogena Rapid Wrinkle Repair Night Moisturizer. I did see a visible difference in just 7 days and I am continuing to use it nightly. Try Neutrogena Rapid Wrinkle Repair Night Moisturizer together with Neutrogena Ultra Sheer Liquid Daily Sunscreen Broad Spectrum SPF 70, both available at CVS and CVS.com. You’ll have an anti-aging power couple on your beauty team! 30 Prize Packs – Enter the Giveaway! 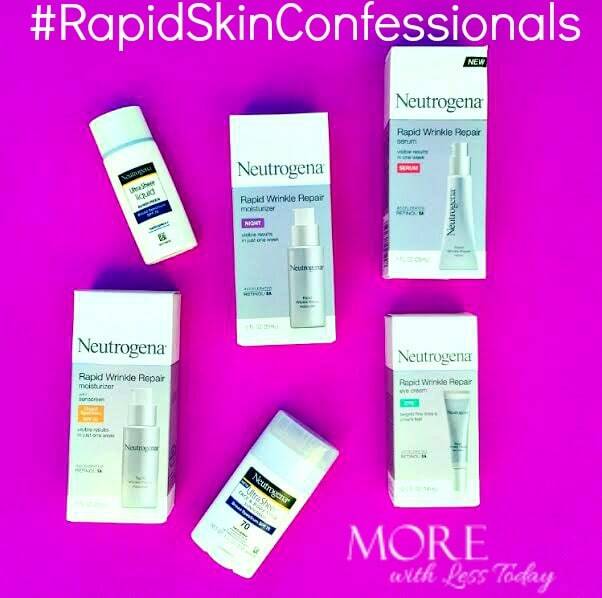 Enter to win 1 of 30 packs of Neutrogena Rapid Wrinkle Repair & Ultra Sheer goodies! The prize has an approximate retail value of $122. Use the easy Rafflecopter to enter. I hope you win! Giveaway will include: Neutrogena Rapid Wrinkle Repair Night Moisturizer, Neutrogena Rapid Wrinkle Repair, Moisturizer Broad Spectrum SPF 30, Neutrogena Rapid Wrinkle Repair Serum, Neutrogena Rapid Wrinkle Repair Eye Cream, Neutrogena Ultra Sheer Liquid Daily Sunscreen Broad Spectrum SPF 70 and Neutrogena Ultra Sheer Face + Body Stick Sunscreen Broad Spectrum SPF 70. This is a sponsored post written by me on behalf of Neutrogena. That is so great that it works so fast! 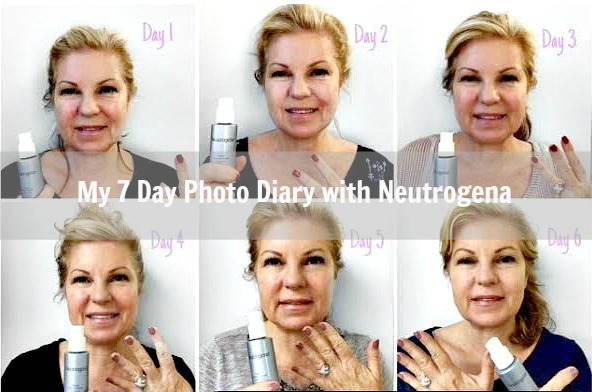 I’ve always had really good results with any Neutrogena products I’ve used. I don;t have any tips! My skin looks awful which is why I need this! Oh my gosh! Are you kidding me!! 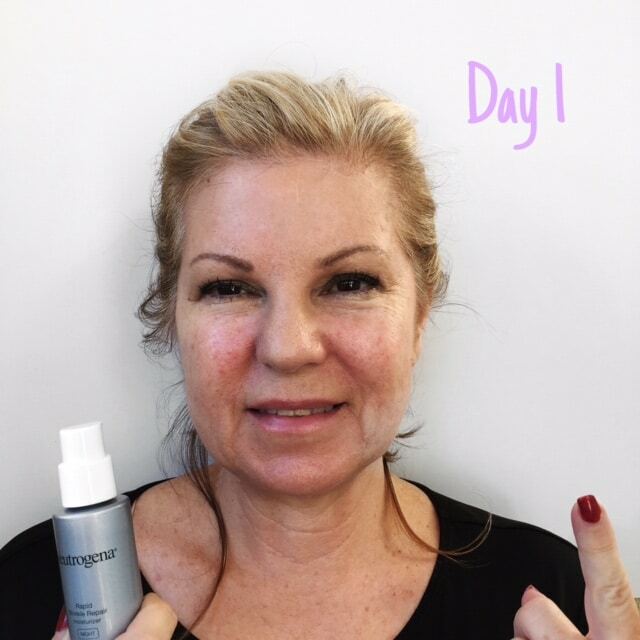 You are beautiful in DAY 1 but it is awesome to see that this product really works. By the end of the week I can see a difference. You are radiating! I am going to have to try this product. I love Neutrogena stuff so this is going on my list for sure. WOW! Looks like this product really works (although you don’t need it, you are beautiful!). Glad to know it works, I will have to enter to win! I love how fast this works!!! Neugtrogena makes amazing products. I know time hasn’t been as kind to my skin as I would want. My mom has been looking for a good product to help with wrinkles. I will have to pick this up for her! I really could use this cream on my face. I am not currently using anything but I have noticed that I am getting a few wrinkles. I am nearing 40 and need to start doing this to avoid some of those pesky wrinkles and crows feet. Neutrogena products have been around for a while but i have never tried them. Now I will have to try the Nuetrogena Rapid Wrinkle Repair Night Moisturizer for sure. I can’t believe how much of a difference you can see after just one week. Thanks for sharing this amazing product and your awesome experience using it. Wow, you look gorgeous! 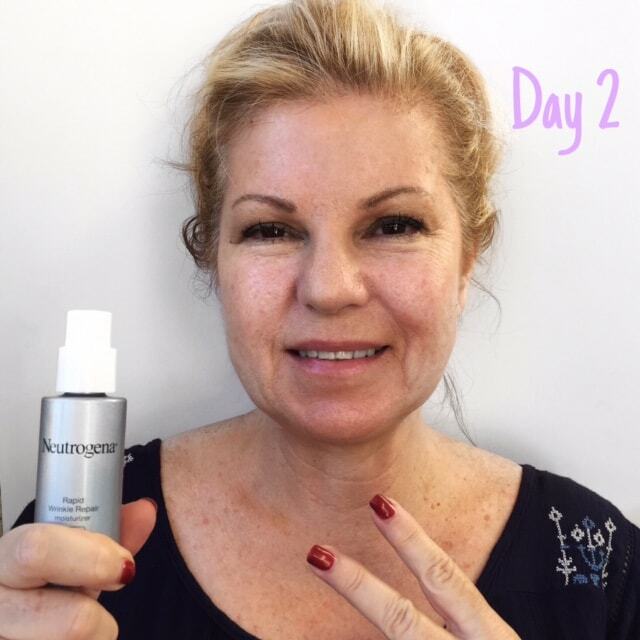 I want to try this rapid wrinkle repair, Neutrogena is a nice brand! I can definitely see a difference. I need to pick some up for myself. 🙂 You look beautiful. I can definitely see a difference. I will pick some up next time I am at the store. You look beautiful! Omg your skin is looksling fabulous girl!!! 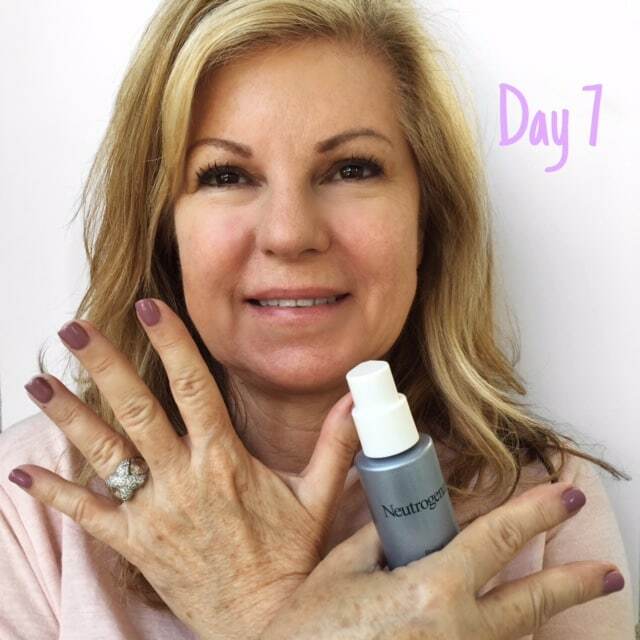 I just love nuetrogena products! I need to get my hands on a bottle of this! You can definitely see the results! 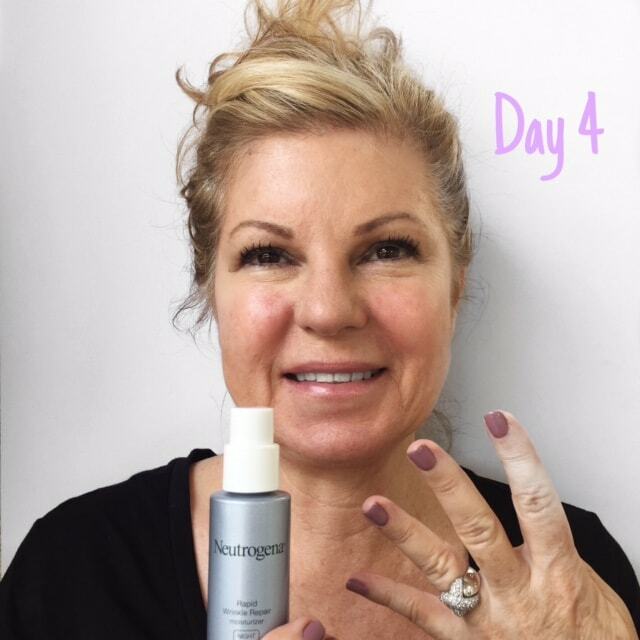 I have always been a fan of Neutrogena and their products! Great skincare company. Looks like it’s working as promised, always great when a company comes through! What great results!! I love Neutrogena, they have the best product lines! Great post! I’ve always been cautious to use sunscreen, but those fine lines are still making their presence known. I’m excited to see Neutrogena once again deliver as promised.